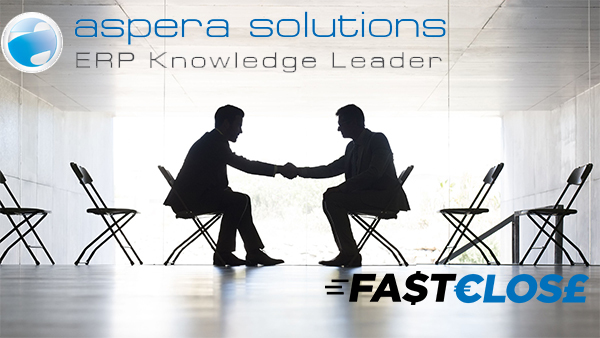 FastClose, a provider of multi-dimensional reporting and enquiry tools for companies’ accounts departments, is delighted to announce a business partnership agreement with Aspera – a reseller of Epicor ERP software – to provide FastClose software in Ireland. Aspera, a Dublin-based reseller of Epicor ERP software, has announced that it has signed an agreement to market and support FastClose in the Irish market. FastClose provides Accounting Intelligence software that is revolutionizing month- and year-end closing for accounts departments. Lonan Byrne, CEO of Aspera, explains the tie-up: “We have been following FastClose’s progress with interest, and a number of our Epicor customers have purchased it to replace key spreadsheets that make up the monthly reporting pack. “Accounts departments turn to Excel because they know it, and they haven’t got the time to learn new software. FastClose is different to other reporting tools as it comes preconfigured with templates that can be easily modified and saved to a local reporting folder. “Significantly, FastClose runs in real-time over the Epicor database and gives the accounts team the capability to drill from high-level P&Ls and Balance Sheets down to the detailed transactions. What’s more, FastClose has developed templates for most of the sub-ledgers like AP, AR, SOP, POP, and inventory – so the drilling does not stop at the GL level. Nick continued on this theme: “We refer to FastClose as an Accounting Intelligence system, which is what accounts departments really need. They are focused on numbers and not graphics – just go around any accounts department and you will see Excel, Excel, and Excel everywhere. Lonan provided more Epicor-specific information: “FastClose in a multi-dimensional reporting tool which means it can take advantage of the 20 account segments in the chart of accounts, multi-books, companies and – in fact – any of the dimensions in Epicor that are used to build management and statutory consolidations. It has a powerful hierarchy engine to mirror your P&Ls and Balance sheets; something you only find in BI systems. The key message is that it’s the accounts team that builds reports… not IT. The empowerment of the accounts team is something that IT and the accounts department both welcome. Finally, Nick had this to say: “We have built up a good user base and will be adding more modules over time, plus we can share report definitions with other customers in order to build up a best of breed reporting pack. One customer of Aspera and FastClose used to take 8 hours to build a sales margin analysis report in Excel; something which now runs in under two minutes real-time over the live Epicor database. Aspera Solutions has over 20 years of experience in implementing and supporting businesses across the Manufacturing, Distribution, Service, and Food & Beverage sectors. The company understands the unique challenges of businesses in an ever-changing landscape and looks to create partnerships and projects that – through vision and experience – lead to just one outcome… success.